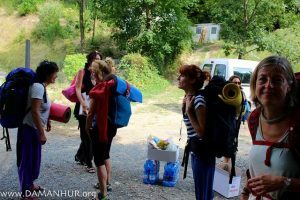 We’ve hosted our first group of intrepid souls for the 10 day Amine’ program, designed to offer a sampling of the most unique aspects of Destination Damanhur for those who are feeling called by their hearts and souls to get closer. “The Amine’ participants really found much more that they had expected, feeling grateful for the truly warm welcome and love that the Damanhurians offered them right upon their arrival and all throughout the experience. Sometimes the nucleo community families that hosted them would go to pick them up from the airport or train station, just like family. They felt so much care and attention. They were also impressed by the level of consciousness that they perceived here. The experience of creating a strong group bond was very important throughout the 10-day journey. They all seemed to be predisposed to do this kind of work, thinking as a group and not as individuals, even though they didn’t know each other as the beginning. They were active in creating their own experience, making suggestions and giving attention to the group dynamics. The group was very united, and they are keeping in touch from a far and intend to return to Damanhur together sometime soon. The participants all joined the Popolo Spirituale. Three of the group members are creating a point of contact in their home countries for Damanhur in the World. Axelina and Rebecka are two new citizens from Sweden, and their mothers came to visit them at Damanhur, one of them participating in Amine’. 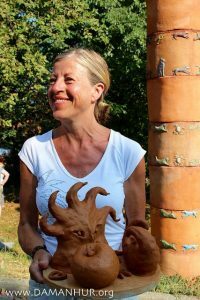 Both mothers fell in love with the community and are now creating a connection for Damanhur in Sweden. There is also a potential connection through an Amine’ participant with Israel, where Past Lives Research courses will be held, and also, one participant from Australia is interested in connecting the Australian aborigines to the Temple of Peoples project. Through the collective art dynamic in Amine’, the participants further understood the value of being together as a group and collective creation. Each person made a drawing and modified someone else’s drawing. Some were hesitant to let that happen, though they discovered that the drawings became even more beautiful due to the intervention of others. The dynamic taught about letting someone in to your territory in a harmonious way… a good metaphor for community living and growing personal dreams by inviting others in. Ready to get out of your daily routine and comfort zones for 10 days… to a lifetime? Participate in one of the next groups for the Amine’ program, starting October 10 and November 7.